– you wedding cake – your way. There’s my headline – cake is not cheap! Lots of people want a real bargain when it comes to wedding cake, but it’s expensive. Butter, cream, all the work that goes into it, from the design to the actual making of your cake can take hours. What you’re actually paying for is the artistry and the quality when it comes to a wedding cake. You want it to be seamless, you want it to be perfection. And that takes a lot of person hours, so cake is not cheap. Don’t try and drive too hard a bargain. If your wedding cake designer are giving you a cake, a whole wedding cake for less than 50 quid, it’s not going to be great. 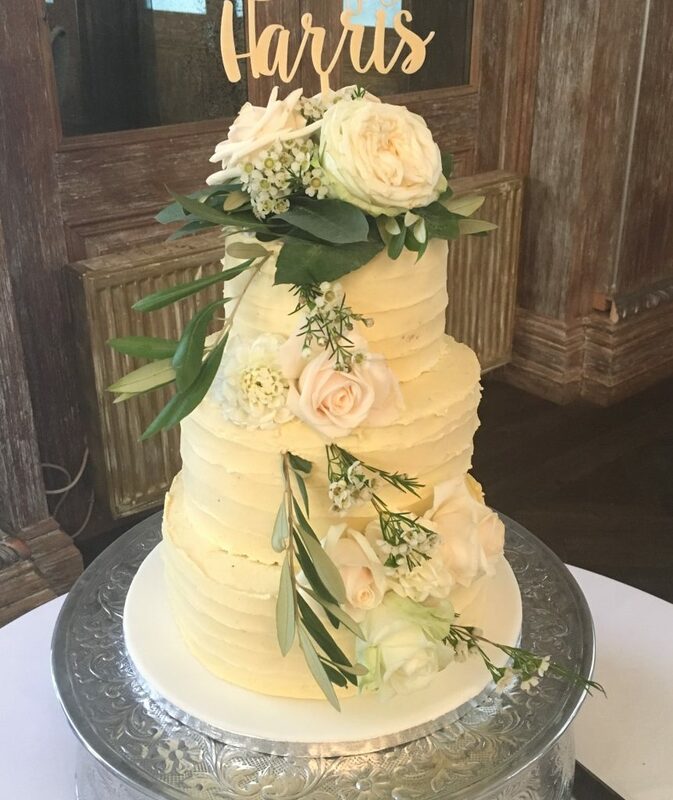 So, make sure if you’re going to have a wedding cake and you want it to be a statement element of your big day, set aside that little bit in your budget for it. Make sure you aren’t eating cake for weeks! 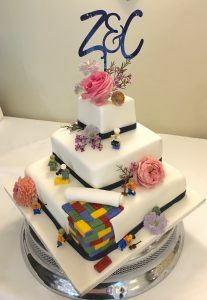 I get people ask me all the time, how can we make cake a cost-effective inclusion in our wedding and to make sure it gets eaten and not wasted or eating it for days. There’s a couple of ways. Firstly, you could have your cake as your dessert. If you have the cutting after your main course, perhaps in amongst the speeches, the venue will take the cake away for you and the caterers will slice and can present it with the coffee, so you can have that dessert and save money on your per head charges for your meal and then everybody gets a piece of cake too. What you could also do is have, if you’re having individual cakes like cupcakes or individually covered, you could have them as your favours, so you don’t have favours on the table, but you make sure everyone goes away with an individual cake at the end of the day. If you don’t fancy the first two options, you could buy some boxes and have those slices of cake boxed and wrapped for your guests to take away and maybe enjoy the next day with a cup of tea while they reflect on what an amazing wedding day they have just been to. All of this guarantees you’re not wasting lots of cake and you’re not bringing home 50 servings of vanilla sponge, which with the best will in the world and me as a cake lover, would even struggle to! With cake – Size does matter! Tip 3 – size does matter. What do I mean by that? An impactive cake is usually a good couple of tiers and usually odd numbers look best, most pleasing to the eye. So you’re talking three or five tiers. But what you don’t want is oodles of cake and spend an absolute fortune on your cake but you’ve only got 50 people coming to your wedding. That’s not cost effective. 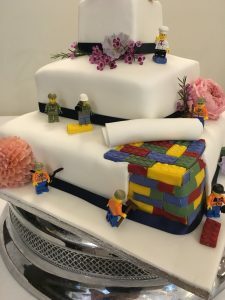 Top tip – You can have a few layers of cake and you can have some false layers put in. 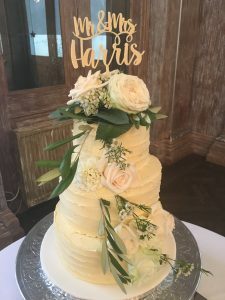 False or fake layers are polystyrene, and they are covered exactly the same way that you would cover a normal cake and you can’t tell the difference, but all it does is give you that extra volume and height and creates big impact when it comes to your cake and how it looks on your special day. So that’s an insider secret for you. And finally, don’t forget to ask about allergies. If any of your guests have nut allergies or quite a common one is an almond allergy. If you’re having a fruit cake and it’s covered in marzipan, you’re going to have problems. So ask about allergies. 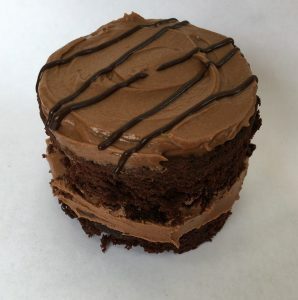 Lots of cake makers now are quite comfortable making gluten-free and lactose-free, so they can always make either one tier or a tiny cake just for those guests with allergies. It’s absolutely workable. your wedding day is your time to stand out and be proud. For inspiration head to Instagram. We’re on Facebook, and we’re on Twitter. We’re also on IGTV and YouTube as well or download your free wedding planner tool here and start getting organised!